October 1st was Jozef Vervoort’s 75th birthday (1/10/1940). The former director of 4 schools, special education teacher and founder of the Atlantis and Mozart-Brain-Lab Institutes in St.-Truiden, celebrated the event on October 3rd with family, friends, coworkers and their companions. Various performances and tributes commemorated his life, which he has dedicated for more than 40 years to the continuation of the work of Prof. Tomatis. During all these years, with untiring zeal and inexhaustible personal commitment, he has never ceased to promote the dissemination of the method internationally. His daughter Astrid and his son-in-law Didier, who are both fully committed to his mission and are his best supporters, had organized a lovingly designed birthday party at the Atlantis cafeteria, attended by 130 enthusiastic guests. Jozef’s greatest wish is to be able to go on with his work in perfect health until he is 100! 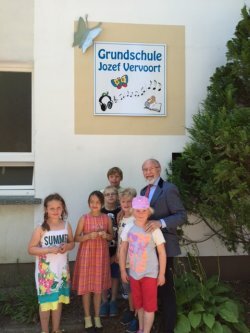 "This school has a soul"
This is a great honor for Jozef Vervoort: Dolgelin Primary School, in the Brandenburg region near Frankfurt Oder in Germany, now bears the name of the leader of the Atlantis and Mozart-Brain-Lab therapy centers of St. Truiden, Belgium. On June 30, 2015, the school was officially named “Primary School Jozef Vervoort”. The event was marked by a big celebration for students, parents, teachers and local authorities (representatives of the local government). Grateful for the honor, the 74 year old man, who was for many years director of several schools, said "This school has a soul." Since 2010, the newly named “Primary School Jozef Vervoort” offers a special program of the Listening Training according to Tomatis. This module provides a most relaxing end to the school day that neither children nor their parents would want to miss. Dolgelin Primary School is leading the way in Brandenburg and is supported not only by the Atlantis Center, but also by the association “Klangfalter”, which is run by Tomatis Therapist Petra Gebauer. By naming the school after Jozef Vervoort, the establishment wanted to show gratitude.